This view neatly encapsulates why the kind of hooliganism experienced in Marseille cannot be divorced from a wider historical context. Since the mid 20th century, Britain in general – but particularly England – has existed in a post-empire historical setting. The question is, why does hooliganism and loutish behaviour appear to be more of an English trait compared to other nationalities? It seems to me that England, more than many other European societies, finds it difficult to cast off its imperial legacy. When groups of English men gather together in a foreign country there seems to be a reluctance among a large swath of them to relinquish the notion of the concept of empire. This mentality appears to be underscored by an entrenched nationalism as evidenced by the repeated singing of the national anthem during games, an emphasis on the notion that ‘Britannia rules the waves’ and that football hooligans carry the mantle of this imperial and colonial legacy, ostensibly on behalf of their ruling class overseers. There seems, in other words, to be something deeply embedded within the mindset of English football fans when they gather collectively that transcends the simplistic argument that their hooliganism is an expression of nothing more than drunken and pathologically-driven related violence and thuggery. This transcendence, I would argue, corresponds to the kind of historical, social and cultural setting described that enables it. Secondly, sport doesn’t exist in a political vacuum. One can see this, for example, in the chants at both club and international level and the England-Germany rivalry which constantly mobilizes ideas about the Second World War. The third broader point is that national sports are a forum and reservoir for jingoistic sentiment in general. What happens is that banal forms of nationalism and jingoistic group-think mentality – expressed through violence and an adherence to political-inspired chanting – is cynically co-opted and reinforced by national states and governments for wider sinister political objectives. Take the current political climate as an example. The right-wing Brexit elements within the EU debate often echo the xenophobic anti-German and anti-European sentiments of many of those who chanted the anti-French rhetoric outlined above. Football hooliganism is not just an illustration of a few ‘bad eggs’ as is so often depicted in the media, but represents a far wider problem. The reality, in other words, is that football tends to be a vehicle for deep-seated expressions and outpourings of nationalistic narcissism and patriotism. This is dangerous in another way in as much as these linkages provide a ready pool which governments can then use in order to justify even more sinister foreign policy purposes such as foreign invasions and occupations. The question is though, are the majority of football hooligans aware of the historical and anthropological background described, or is it simply that English men these days don’t generally go to war or fight as part of an organized army but have a lot of testosterone-based pent up aggression that needs to be expelled? I would contend that it’s not necessary for individuals to be conscious of the notion of post-empire and the loss of colonial possessions – what dissident French psychoanalyst Jacques Lacan termed jouissance – in order for them to experience excess indicative of societal breakdown achieved as part of a shared group. There are certain settings or locations in which the establishment deem it unacceptable to reach jouissance – mainly within the political sphere. This sphere has increasingly become limited because of the potential threat it poses to the existing class structure that this implies. Instead, jouissance is channeled as a displacement activity at football matches, pubs, nightclubs and bars. Paradoxically, it’s precisely these kinds of violent outpourings or expulsions of visceral energy that enables civilized society to function. 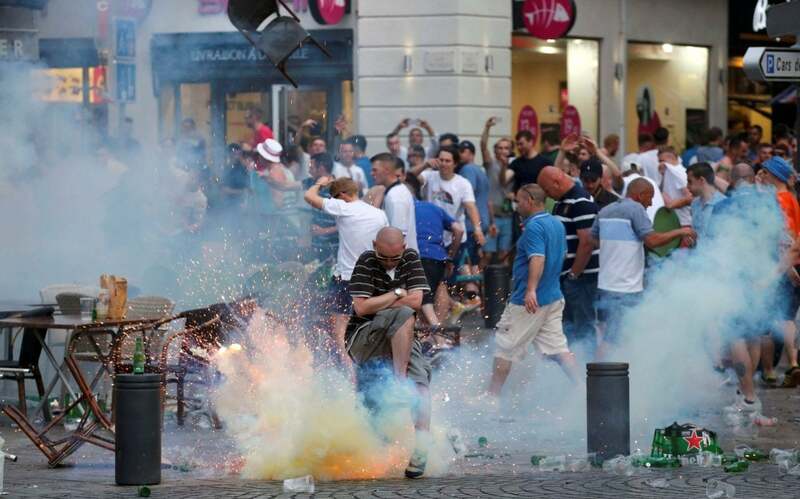 If the collective outward violent expression of mainly young men were to be severely suppressed, football hooligans and others would almost certainly turn their energy inwards which would be even more dangerous as far as its impact on civilized society is concerned. This is because any suppression of ‘orgasmic’ violence would be more radically destabilizing in terms of the potential for the derailment of the functioning of wider society. In other words, any major repression of the ability of hooligans to vent their anger might instead be turned against their bosses and, perhaps more widely, the owners of the means of production itself. This is, of course, not in any way an attempt to justify the kinds of hooliganism witnessed in Marseille, but to recognize that in a wider symbolic and societal setting, such violence is arguably necessary. Englishmen abroad with their smart phones and apps, set against a context of Cultural Marxism, is an unholy, potent and potentially perilous mix for the establishment to negotiate. Nevertheless, it’s a trade-off that the said establishment is willing, albeit reluctantly, to endure in order that the current political status-quo be maintained.